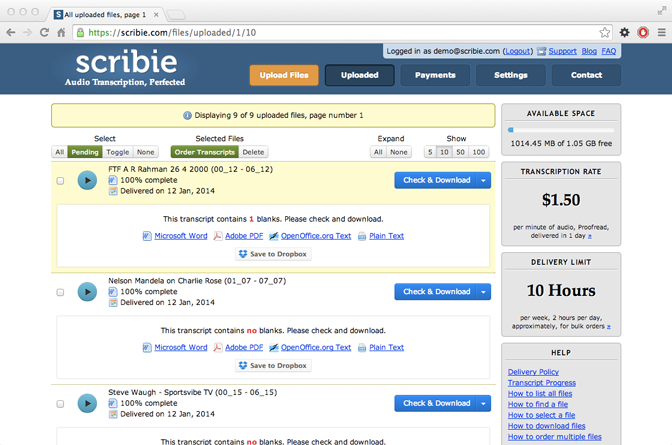 At Scribie, we want to make it as easy as possible to get your files transcribed. Getting the files on our server is the first step which involves upload the files through the browser. It works great for small to medium sized files, but tends to take a long time for larger files. 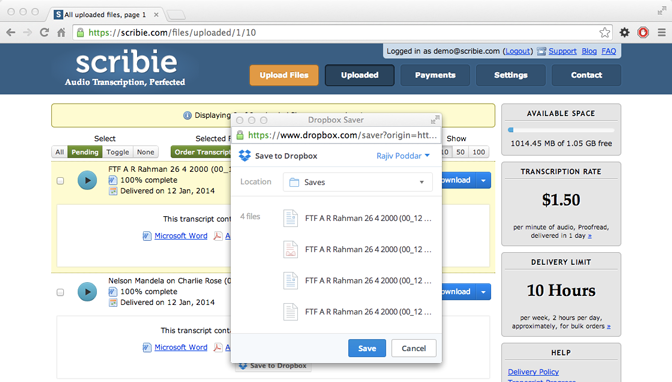 Importing files from Dropbox faster and easier in such cases. In this post we’ll walk through the steps of importing files from Dropbox and saving the transcripts to Dropbox. Go to our Uploader page and click on the Dropbox icon on the left side tabs. This will show you the following page. Click on the ‘Choose from Dropbox’ button. It will open a popup window on Dropbox.com. Login to Dropbox, if you’re not already and then select the files. You can select multiple files at a time. Once files are selected, click on the Choose button at the bottom to start the import process. Once the transcripts are delivered, and after you have checked them for blanks, you can save the transcripts to your Dropbox account as well. 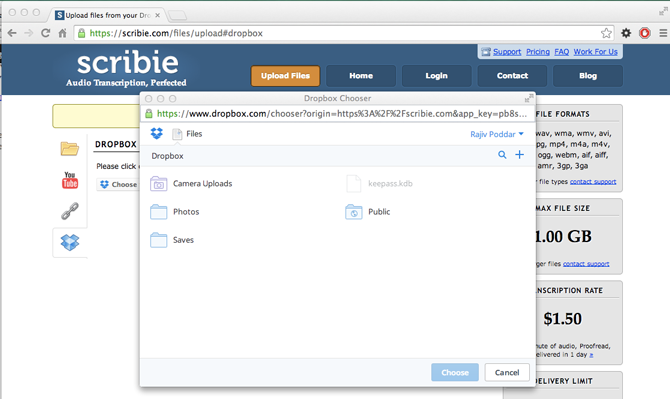 Go to your Scribie.com account, Uploaded Files page and click on the ‘Save To Dropbox’ button. It will bring up a popup window with your Dropbox account and you can then select a folder to save the files to. Click on the Save button and you’re done. The transcripts will be available on all your connected devices. The files are transferred to/from your Dropbox account securely and you do not have to share your Dropbox account information with us. Try out this feature today and let us know what you think. We’ll be glad to help you out if you face any issues. Today, we introduced a new transcript ordering process and UI. Transcripts are one of the premium features we offer and it is the cornerstone for our business model. Till now we had been offering the service for free. But starting today, we have changed our policy to offer only the first transcript for free. For subsequent orders, an advance payment is required. The payments can be made from PayPal as of now. Here’s how the new process works (click on the images to see a larger version). Once the uploaded file is screened by our system you will get a notification and a link. The link will lead you to the transcripts page. Its a new page and a new menu item. Click on the ‘Order’ button to place an order. The system will detect if its your first transcript order and offer it for free. In case this is not the first transcript order then the price will be mentioned and clicking the ‘Order’ button will lead you to the PayPal gateway. Once the order is done, it will provide a confirmation. If you want to check your transcripts any time then click on the ‘Transcripts’ page on the menu. It will show all the ordered transcripts and the files for which it can be ordered. Only the first transcript will be offered for free and the subsequent ones will be charged on a per line basis. The cost per line is 7 cents. The payment has to be made in advance and the transcript will be delivered within 18 hours after we receive the payment. We have also relaxed the minimum duration criteria for screening of call records. Now all call records more than 1 MB are screened by our system. Ability to view the transcripts, download it, search through it, share it with others etc. If you have any suggestions please send them across. If you have ordered transcripts in the recent few days then it probably has gone into a black hole due to the changes that were being done. We’d request you to place the transcript order once again. We’ll be mailing you individually as well regarding this. Please let us know what do you think of these changes. Is this interface simple enough? Is the policy okay? Price high, low? We’d be glad to hear your thoughts on it. Thanks.